2016 Mayfair Christmas Decoration Contest WINNERS! Here it is Mayfair - The moment that you've all been waiting for! The 2016 Mayfair Christmas Decoration Contest was an unbelievable success with over 140 entries this year. What was really cool to see this year was how neighbors "upped their game" because of this Contest and added even more lights and decorations to their homes, and how many NEW entries that we had this year. It was all VERY cool to see and every year Mayfair continues to shine a little brighter! I'm so glad that we decided to split the Contest up into 3 Categories this year and added a separate Row Home Category. Several Row Homes owners really do go all out decorating their homes however they only have so much room to work with. Giving them their own Category was the right thing to do, and it was a huge success! The competition was once again extremely fierce which made judging the nominations very difficult. We don't do a "1st, 2nd or 3rd" in the Contest, we simply award the Top 3 in each Category. 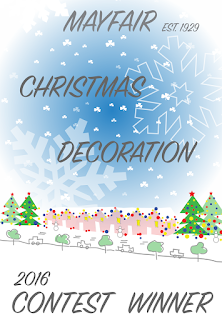 2016 Mayfair Christmas Decoration Contest! A very special Thank You to our Mayfair Business Association Members who were extremely generous with their prizes this year! Please take a moment to stop by and thank them for what they do for you, for your family, and for your community! It started out only four years ago, but it has already become a family tradition for many. If you haven't done so already, take a moment to check out our Google Map with all of the entries in the Contest, grab the family, and take a ride around Mayfair - It really is beautiful! There are several people to thank starting with the reporters and their editors who covered our Contest, especially Bill Kenny and Tom Waring of the Northeast Times, the Mayfair Business Association Members who donated the prizes, Luka of the Mayfair CDC for creating our beautiful lawn signs printed by Aztec Signs, our 12 Judges who spent a countless amount of hours driving around Mayfair and scoring the 140+ entries, The Ashburner Inn for driving our Judges around in their bus, but most importantly, I'd like to thank the neighbors in Mayfair who went above and beyond this year while decorating their homes. Without you, this contest would not exist! Working together as a community, we have proven that Mayfair is indeed, A Great Place to Visit, and an Awesome Place to Live! 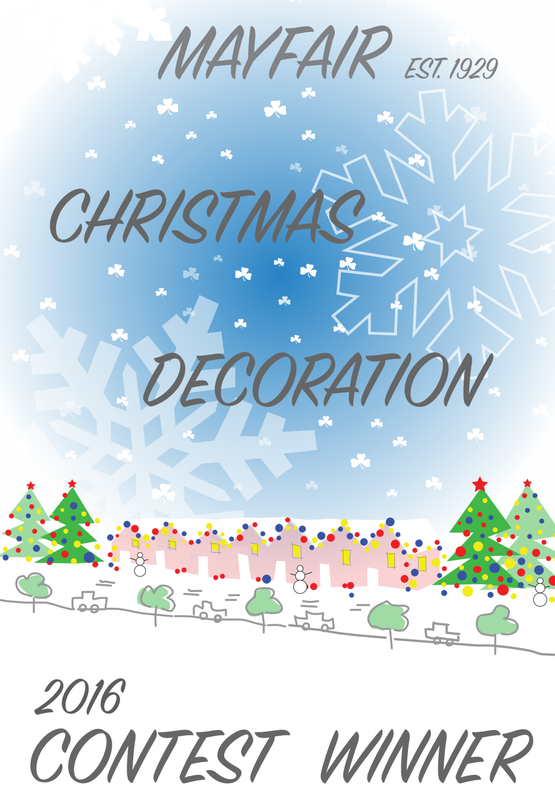 Here it is folks - The 2016 Mayfair Christmas Decoration Contest Google Map! Just like last year, we have over 100 entries so far, and just like last year, the competition is fierce! 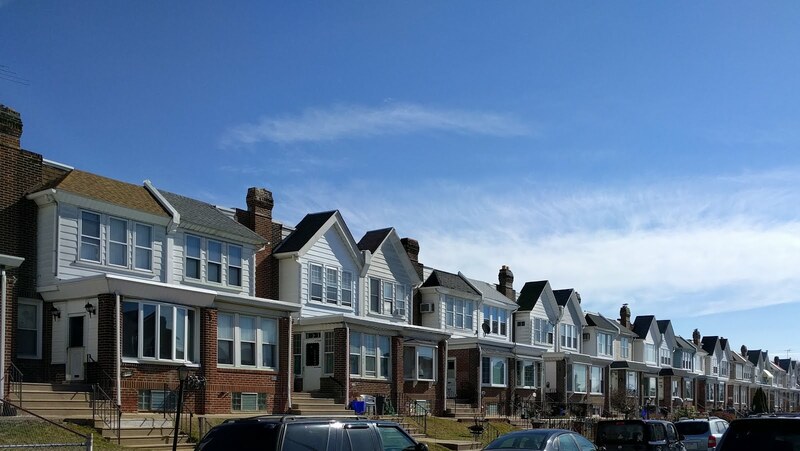 I drove around last night to check out some of the entries and as expected, last years winners have stepped up their game, and now that we have added a separate Row Home category, several row homes have stepped it up as well! Starting on the 14th and throughout the week, keeping with the "12 Days of Christmas" theme, 12 Judges will cruise around Mayfair and give each home a score from 1-12 with 12 being the best. Keep the entries coming Mayfair - Have FUN! 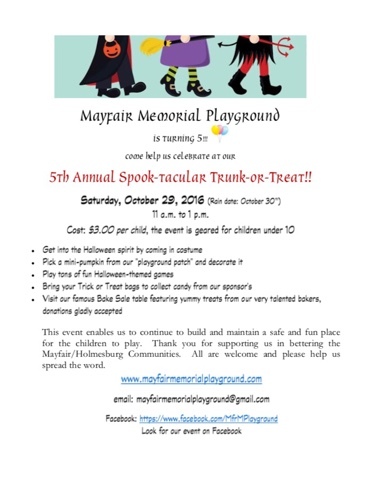 ​It's the 5th Birthday Celebration for the Mayfair Memorial Playground (next to Lincoln High School) and we are throwing a HUGE party; Our 5th Annual Halloween Birthday Spooktacular Fundraiser on Saturday, October 29, 2016 (rain date October 30th) from 11 a.m. to 1 p.m. Sponsors must arrive by 10 a.m.! This year it will be a Trunk-or-Treat event. Sponsors will wear costumes, decorate their car trunks and give out candy to the children. ​The Halloween Spooktacular is not just a birthday celebration; it's also one of our major fundraisers. We are a volunteer organization who relies entirely on generous donations. We pride ourselves on trying to be as self-sufficient as possible and continue to raise money to add additional equipment and maintain our playground. We have more projects in the works, which is why we are looking for sponsors to participate in our Trunk-or-Treat event. You can participate as a sponsor for $50 and you can pass out information about your business or organization to our parents, as long as you provide candy for the children who attend and "Trunk-or-Treat.” You must bring your car decorated for Halloween, candy and supplies. In the past, we typically draw in about 500 -700 people. 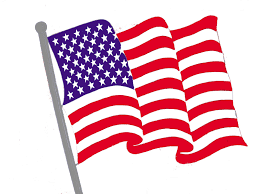 You are free to provide any kind of approved handouts, political materials, organizational or promotional information and provide candy for our participants. This is a great way to get the word out about your organization, business, or cause and we would be honored to host you. ​There is a deadline of Friday, October 21, 2016 for sponsorship. Please return the attached application and your minimum payment of $50 per space. Please let us know if you have any questions regarding this matter. Please fill out this page and send in with your payment! Don’t forget to make a copy for your records. Yes! I would love to be a sponsor at the Mayfair Memorial Playground 5th Annual Halloween Trunk-or-Treat Spooktacular Fundraiser! It is a fun event, where you wear costumes and decorate your car trunk and fill it with candy. The children can go car-to-car to get treats. I understand that I can pass out approved promotional materials, business cards and information, but I MUST PROVIDE CANDY for approximately 500 - 700 children for the Trunk-or-Treat portion of the event and be set up by 10 a.m. I understand my payment must be received by 10/21/16, otherwise the price will go up to $75. No one will be allowed to set up without payment made! Please make a copy of this form to keep for your records. We are a non-profit and tax exempt organization, our EIN is 47-2441391. Thank You for your donation and we look forward to seeing you on October 29, 2016, with your car (trunk), supplies and treats for the kids. You must be set up and ready to go one hour before the event begins; 10:00 a.m. Thank you so much for agreeing to host a Trunk-or-Treat at our 5th Annual Mayfair Memorial Playground Spooktacular Fundraiser! Like our Easter Egg Hunt, this will be a great neighborhood event and we are so grateful for your support. All proceeds raised via the sponsorship and during this great family event will go towards our ongoing efforts to maintain the playground and for our last pieces of equipment to be installed in the very near future. This year we are changing the event from a Trick or Treat to a Trunk-or-Treat. Instead of worrying about tables, sponsors will use their back of their cars to give out treats. Simply decide on a theme for your trunk, decorate it, wear a costume to go with it and give out treats to the kids and approved information to the parents. Below is some information for the day of the Spooktacular that hopefully will answer any questions you may have. · Since you will be arriving by car you will be given a spot to pull into behind the playground. You must arrive by 10 a.m. to park your car. We cannot have sponsors arriving once the event begins because it will not be safe to have cars moving around with all the little children excited for the event. If you wish, you can bring a canopy or covering in the event of inclement weather, but this is not required. · We ask that you provide Halloween candy for approximately 500 - 700 children. They will have bags given to them at the entrance or will bring their own. 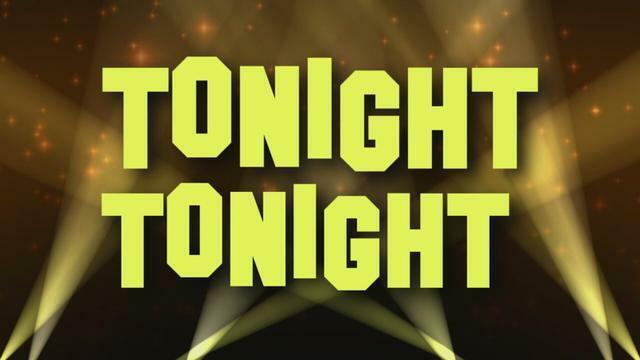 · You can hand out fliers, pamphlets, business cards, magnets, anything pertaining to your business, candidate, or organization to the people who attend. You may also put signs or banners for your business or candidate ONLY on or around your table or canopy. We will not allow any signs or banners placed on any of the premises, other than your immediate area. · We ask that you decorate the trunk of your car in a Halloween theme. You do not have to go crazy with this, but if you want to go all out, please feel free! It just makes the event more fun and colorful for everyone attending. · Please feel free to wear costumes, but nothing too scary! This event is mostly attended by kids under 10. Time: 11 a.m. to 1 p.m. We ask that all sponsors please arrive, at the latest, by 10 a.m. to give yourselves adequate time to be placed and to set up. Spots will be assigned on a first come, first serve basis. Location: Mayfair Memorial Playground (next to Lincoln High School) Intersection of Ryan Ave and Vista Street. Set-up area: In the parking lot directly adjacent to the playground and next to the pool. Additional Parking: Mainly street parking. Lincoln High School does have a lot, but if there is an event happening at the school, it may be full.